Heralded as a “technically impeccable and musically profound” pianist, Andrew Cooperstock performs widely as soloist and chamber musician and has appeared throughout six continents and in most of the fifty states. Winner of the National Federation of Music Clubs Artist Competition and the New Orleans International Piano Competition, Andrew Cooperstock has performed at New York’s Alice Tully, Merkin, and Weill concert halls, Greenwich Village’s (le) Poisson Rouge, Brooklyn’s BargeMusic, and at the United Nations. He has been featured in recitals and concerto appearances at the Chautauqua, Brevard, and Round Top international music festivals, the Australian Festival of Chamber Music, and in such global centers as Chicago, Philadelphia, Detroit, New Orleans, Minneapolis, Baltimore, London, Hamburg, Geneva, the Hague, Riga, Canberra, Lima, Kiev, Seoul, Sapporo, Beijing, and Accra. An advocate for new music, Andrew Cooperstock has premiered works by such American composers as Lowell Liebermann and Aaron Copland. He has also commissioned works by Eric Stern, Robert Starer, and Dan Welcher. A sought-after chamber musician, Cooperstock has performed with the Takács Quartet, the Ying Quartet, the Dorian Quintet, violinist James Buswell, violist Roberto Diaz, cellists Andres Diaz and András Fejér, hornist Eli Epstein, and pianist Paul Schoenfield. He is a member of the Colorado Chamber Players, a regular soloist with the Boulder Chamber Orchestra, and a founder of Trio Contraste, which specializes in commissioning and performing contemporary music for piano, violin, and clarinet. With violinist William Terwilliger, as Opus Two, Cooperstock has recorded the complete works for piano and violin by Aaron Copland. The award-winning Opus Two has been internationally recognized for its “divine phrases, impelling rhythm, elastic ensemble and stunning sounds,” as well as its commitment to expanding the violin – piano duo repertoire. The duo has appeared throughout North and South America, Europe, and Australia, and it made its Asian debut in 2006 with performances across China, Korea, Japan, and the Russian Far East. In March 2011 they were in residence with the National Symphony of Ghana, Africa, and at the University of Ghana Legon, and in August they were featured performers at Hong Kong’s premier chamber music festival, Hell Hot! Their appearance at Woodstock, New York’s prestigious Maverick Concerts was called “one of the most significant and worthwhile concerts of the 2010 season.” With cellist Andres Diaz, Opus Two has also recorded chamber music by Lowell Liebermann (Albany Records) and Paul Schoenfield (Azica Records). 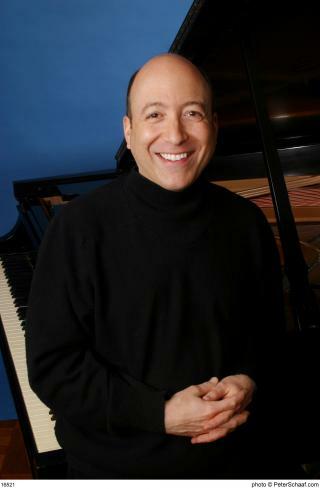 Opus Two’s recording of Leonard Bernstein (Naxos) features new arrangements by legendary Broadway music director Eric Stern and collaborations with Broadway actress-singer Marin Mazzie, and their next CD, a 75th-anniversary tribute to American composer George Gershwin, will feature a newly commissioned Eric Stern arrangement of beloved songs from Girl Crazy. Andrew Cooperstock’s media credits include performances on National Public Radio, WFMT Chicago, WQXR New York, KVOD Denver, KUT Austin, and on Minnesota Public Radio, Radio France, and the Australian and British Broadcasting Corporations. He has served as juror for the New Orleans International Piano Competition, the Iowa International Piano Competition, the Liszt-Garrison International Competition, China’s Giant Cup Art Talent Competition, the Music Teachers National Association national competitions, and the National Federation of Music Clubs Young Artists Competition, among others, and he has presented master classes widely, from Beijing to Nice to Vladivostok. A graduate of the Juilliard School and the Cincinnati and Peabody Conservatories, he studied with Abbey Simon, David Bar-Illan, and Walter Hautzig, as well as with collaborative pianist Samuel Sanders. Dr. Cooperstock is currently chair of the keyboard department at the University of Colorado at Boulder, chair of piano at Rocky Ridge Music Center, and faculty member at Vianden International Music Festival in Luxembourg. He is a Steinway artist.